This new entertaining and inspirational movie based on the best-selling book of the same name is hosted by author, teacher and publisher Louise Hay. This film gives penetrating and surprising insights into Louise’s fascinating personal story (she was an abused foster child and overcame many early traumas; and she brought supportive community to early AIDS sufferers); and shows how her views on self-esteem, abundance, and the metaphysical causes behind physical ailments were developed. It also reveals how she applied these concepts to her own emotional, spiritual, and professional life. The more you appreciate yourself and what’s in your life, the more you’ll have to be thankful for. It’s as simple as that. A number of luminaries in the fields of self-help, philosophy, health, spirituality, and New Thought join Louise, giving their personal take on success, happiness, and the myriad ways in which people can heal their own lives. And there are also some moving firsthand accounts from others who have been positively affected by Louise’s work. A nifty and useful “Affirmation Toolkit” is also on the DVD, and the extended edition features over 4 hours of longer interviews with the people mentioned below. Appearing in the movie are Wayne Dyer, Candace Pert, Gregg Braden, Mona Lisa Schulz, Cheryl Richardson, Christiane Northrup, Jerry and Esther Hicks (The Teachings of Abraham), Gay Hendricks, Doreen Virtue, and Leon Nacson. The music is composed by Grammy Award winner Jim Brickman. Among Louise Hay’s many titles are Heal Your Body, Power Thought Cards, and Morning & Evening Meditations CD. This entertaining and inspirational movie based on the best-selling book of the same name is hosted by author and teacher Louise L. Hay. This film gives penetrating insights into Louises fascinating personal story; and shows how her views on self-esteem, abundance, and the metaphysical causes behind physical ailments were developed. It also reveals how she applied these concepts to her own emotional, spiritual, and professional life. A number of luminaries in the fields of self-help, philosophy, health, spirituality, and New Thought join Louise, giving their take on success, happiness, and the myriad ways in which people can heal their own lives. Feature appearances by Gregg Braden, Dr. Wayne W. Dyer, Jerry & Esther Hicks (The Teachings of Abraham), Christiane Northrup, M.D., Candace B. Pert, Ph.D., Mona Lisa Schulz, M.D., Ph.D., Cheryl Richardson, and Doreen Virtue, Ph.D. 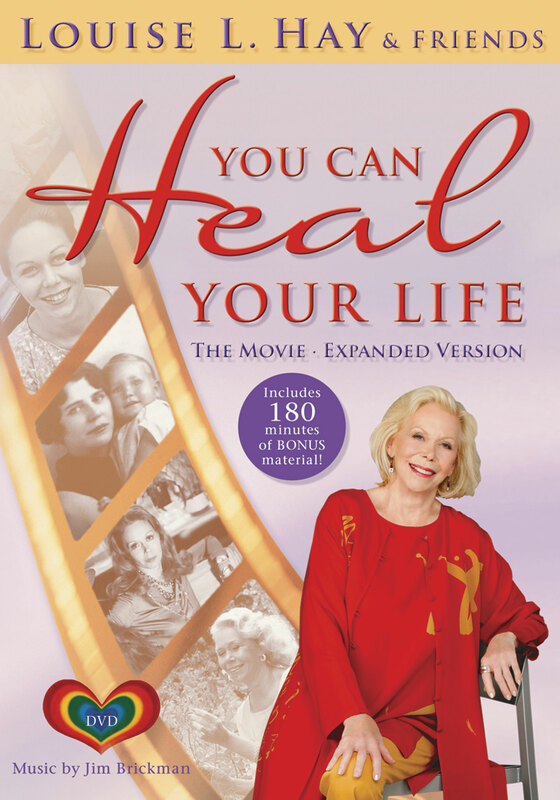 Hosted by best-selling author Louise Hay and directed by Emmy-winner Michael Goorjian, this entertaining movie explores Hays fascinating life story and her views on self-esteem, abundance, and the metaphysical causes behind physical ailments. It features music by Grammy-winner Jim Brickman. Doreen Virtue, Gregg Braden, Wayne Dyer, Christiane Northrup and many others share their personal stories about Louises impact on their lives. This expanded version includes over four hours of bonus material, including 60 minutes of Interactive Teaching Affirmations and three hours of extended interviews. January.